This article was published in the Spring 2016 Baseball Research Journal. Editor's note: This article was selected as a finalist for a 2017 SABR Analytics Conference Research Award. In the immediate aftermath of the exciting Game Seven between the Kansas City Royals and San Francisco Giants in 2014, the baseball world fixated on one question: should Alex Gordon have been sent home with two outs in the bottom of the ninth inning as his hit was being botched and booted somewhere near the left-center field wall? Indeed, no less a numbers guru than Nate Silver tweeted that—regardless of the outcome on that potential play-at-the-plate—it would have been one of the five greatest moments in baseball history. However, what happened immediately after that play (with Gordon on third and Madison Bumgarner pitching to Salvador Perez) is far more remarkable, and this paper presents data to support that claim. The six pitches Bumgarner threw to Perez had the ability to win the World Series for either team. That is, each of those six pitches could have produced a World Series championship for the Royals (had Perez hit a home run) or the Giants (had Perez grounded out to shortstop, flown out to right field, or, as he did, fouled out to the third baseman). For lack of a better phrase, and for ease of conversation, I will refer to these pitches as “Golden Pitches,” borrowing perhaps from the concept of a Golden Goal in sudden death overtime of a soccer or hockey game. By definition, under the current best-of-seven World Series format, a Golden Pitch can only be thrown in Game Seven of the World Series and only in the bottom of the ninth inning when the road team has the lead (or in the bottom of an extra inning, if the road team scores in the top, as was the case in Game Seven of the 1912 World Series, the first time a Golden Pitch was thrown1). Indeed, in no other situation could either team win the World Series on a given pitch. Some of the greatest and most dramatic moments in World Series history did not involve Golden Pitches. Carlton Fisk’s epic home run came in Game Six of the 1975 World Series; only the Reds could have won the Series that night. For that matter, Fisk’s home run came with the score tied in the bottom of the twelfth inning; only the Red Sox could have won the game on that pitch. A similar point can be made about Joe Carter’s Series-winning home run in 1993: it happened in Game Six, so only the Blue Jays—not the Phillies— could have won the title that night. In the 2011 World Series, the Rangers came within one strike of winning the championship on two separate occasions, but both came in Game Six (in the bottom of the ninth and tenth innings). As dramatic as that game was, only the Rangers—not the Cardinals—could have won the World Series that night. The pitch Ralph Terry threw to Bill Mazeroski in 1960 comes close to meeting the criteria of a Golden Pitch because it was the bottom of the ninth inning of a Game Seven, but the game was tied when the pitch was made. Only the Pirates could have won the World Series on that pitch. The best the Yankees could hope for was that the game would make it to extra innings. Game Seven of the 1991 World Series is ranked by some historians as the greatest baseball game ever played, and yet no Golden Pitches were thrown. Several pitches were thrown in the bottoms of the ninth and tenth that could have produced a victory for the Twins (including the one thrown to Gene Larkin that eventually did win the World Series for Minnesota), but not a single pitch thrown in that game could have won it for Atlanta. The exact same can be said about the longest World Series Game Seven ever played (in 1924)—since only the home-team Nationals could have won the World Series during at bats in a tied game in the bottoms of the ninth, tenth, eleventh, and twelfth innings. Since the visiting Giants never took the lead in any of those innings, there were no Golden Pitches thrown. A handful of the 37 Game Sevens that have been played were so one-sided that there was no possibility of a Golden Pitch being thrown.2 Other Game Sevens were close, but since the visiting teams lost, the home teams never had to bat in the bottom of the ninth inning, and thus by definition, no Golden Pitches were thrown.3 However, several other Game Sevens came close to meeting the criteria for a Golden Pitch, but fell just short. 1955: The visiting Dodgers took a 2–0 lead into the bottom of the ninth inning at Yankee Stadium. Had two runners reached base (creating the potential of a Series-winning three-run home run), a Golden Pitch could have been thrown. But Johnny Podres retired the side in order. 1957: The visiting Milwaukee Braves led 5–0 in the bottom of the ninth inning at Yankee Stadium. The game ended when Lew Burdette got Bill Skowron to ground into a force out at third base with the bases loaded and two outs. Two more batters would have had to reach for a Golden Pitch to be thrown. 1958: The visiting Yankees took a 6–2 lead into the bottom of the ninth inning against the Milwaukee Braves. The game ended when Red Schoendienst lined out to center field with runners on first and second. Two more batters would have had to reach base for a Golden Pitch to be thrown. 1965: With the Dodgers leading the Twins 2–0 in the bottom of the ninth inning, Harmon Killebrew singled off Sandy Koufax with one out. Had one more batter reached base, Koufax would have thrown at least one Golden Pitch, since a double play (with two on and one out) could have won the Series for the Dodgers and a three-run home run could have won it for the Twins. Instead, Koufax struck out Earl Battey and Bob Allison to end the game. 1968: The visiting Tigers took a 4–0 lead into the bottom of the ninth inning in St. Louis. With two outs, Mike Shannon hit a solo home run to cut the Tigers’ lead to 4–1. Had the Cardinals then loaded the bases, thus creating the possibility of a Series-winning grand slam, at least one Golden Pitch would have been thrown. As it was, Mickey Lolich retired Tim McCarver on a foul pop to catcher to end the game. 1971: The visiting Pirates took a 2–1 lead into the bottom of the ninth inning in Baltimore, but Steve Blass retired the Orioles in order, and so no Golden Pitches were thrown. Since no one reached base, no pitch Blass threw in the bottom of the ninth could have won the Series for Baltimore. 1975: After Joe Morgan’s go-ahead RBI with two outs in the top of the ninth inning, the Reds took a 4–3 lead into the bottom of the inning. The Red Sox were retired in order, and so no Golden Pitches were thrown. Carl Yastrzemski made the final out, but the best he could have done during his at-bat was tie the game (with a solo home run), not win it, for Boston. 1979: The visiting Pirates took a 4–1 lead into the bottom of the ninth inning in Baltimore. Had the Orioles loaded the bases, thus creating the possibility of a Series-winning grand slam, at least one Golden Pitch would have been thrown. As it was, Kent Tekulve retired the side in order. To gain a full appreciation of just how rare a Golden Pitch is, and to put in perspective how incredibly consequential the Bumgarner-to-Perez sequence was in 2014, I investigated how many (how few) Golden Pitches have been thrown in baseball history. Using Baseball-Reference.com, which charts pitch counts for games beginning in 1974, I was able to definitively calculate the number of Golden Pitches thrown in 1997, 2001 and 2014. Various newspaper accounts were helpful in calculating the number of Golden Pitches that were thrown on the first four occasions in 1912, 1926, 1962, and 1972. In fact, using both Baseball-Reference.com and newspaper accounts of the games in question, we know for certain how many Golden Pitches were thrown to 10 of the 12 batters who have faced such pitches. For only two batters—Bob Meusel in 1926 and Chuck Hiller in 1962—is there ambiguity regarding precisely how many Golden Pitches they faced. However, when Hooper flew out to Snodgrass (with Engle advancing to third base on the play), for the first time in baseball history the next several pitches all had the ability to win the World Series for either team. Steve Yerkes was the next batter, and now with a runner at third base and one out, each pitch Mathewson threw to him was a Golden Pitch. Yerkes could have hit a two-run home run (which would have won the World Series for the Red Sox), or he could have hit into an unconventional double play (which would have won the World Series for the Giants). According to the New York Times, Yerkes walked on five pitches, which brought Tris Speaker to the plate with runners on first and third and one out. Once again, every pitch Mathewson threw to Speaker was a Golden Pitch: a triple or two-run double would have won the World Series for the Red Sox, while a double play (including a conventional 6–4–3, 4–6–3, or 5–4–3 double play) would have won the World Series for the Giants. So, the only Golden Pitches thrown by Mathewson were the five he threw to Yerkes and the two he threw to Speaker. Therefore, Mathewson threw a total of seven Golden Pitches. The visiting Cardinals took a 3–2 lead into the bottom of the ninth inning. Pete Alexander retired the first two batters before facing Babe Ruth. The pitches Alexander threw to Ruth were not Golden Pitches, since the best Ruth could do in that at-bat was hit a solo home run and tie the game. Instead Ruth walked, which meant that any pitch Alexander threw to Bob Meusel would be a Golden Pitch. Sources differ on whether Alexander threw one or two pitches to Meusel, but Ruth was caught stealing to end the game. Alexander, therefore, threw either one or two Golden Pitches. The Yankees’ Ralph Terry took a 1–0 lead into the bottom of the ninth inning and gave up a leadoff bunt single to Matty Alou. He faced Felipe Alou next, but since the pitches he threw to Felipe Alou only had the ability to win the World Series for the Giants (had Alou hit a two-run home run) and not the Yankees (since the best Terry could hope for during that at-bat was a double play that would still have left New York one out shy of victory), they were not Golden Pitches. 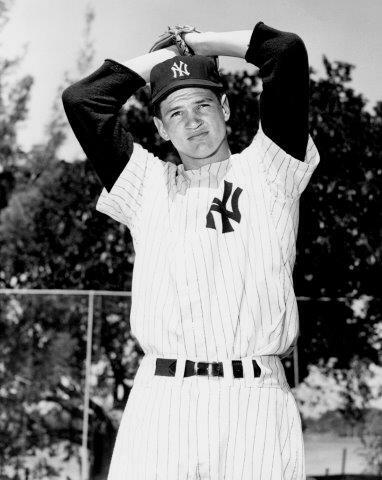 Terry struck out Felipe Alou, which meant that he did throw Golden Pitches to the next batter, Chuck Hiller, since a double play at that point would have produced a World Series victory for the Yankees. There are no reliable accounts of Hiller’s at bat, but since we know he also struck out, at least three Golden Pitches must have been thrown. Fortunately, newspaper accounts do make clear what happened next. After Hiller struck out, Terry threw three Golden Pitches to the next batter, Willie Mays, who doubled down the right field line on a 2–0 pitch to put runners and second and third with two outs. Willie McCovey then fouled off the first pitch before lining out to the second baseman on Terry’s final Golden Pitch, thereby ending the game. The pitches Terry threw to Hiller, Mays, and McCovey were all Golden. Since Hiller struck out, we know he faced at least three Golden Pitches, but it is reasonable to assume he may have faced a few more. We know for certain that Mays faced three Golden Pitches and McCovey faced two. Therefore, Terry threw at least eight Golden Pitches, and probably a few more, giving him the distinction of having thrown more Golden Pitches than any other pitcher. Working with a one-run lead entering the bottom of the ninth inning, the A’s Rollie Fingers retired the first two batters before hitting Darrel Chaney with a pitch. With a runner at first and two outs, every pitch Fingers threw to the next batter, Pete Rose, was a Golden Pitch. Rose could have hit a two-run home run to win the World Series for the Reds, or he could have made an out (as he did, flying out to left fielder Joe Rudi), thereby giving the championship to the A’s. Both the New York Times and the Washington Post reported that Rose hit the first pitch to Rudi, so we know that Fingers threw one Golden Pitch. Bonilla struck out, which brought Charles Johnson to the plate with a runner at first and one out. The four pitches Mesa threw to Johnson were Golden Pitches, since now a potential double play would have won the World Series for the Indians. Johnson singled to right field on a 1–2 pitch, which put runners at first and third with still only one out. The three pitches Mesa then threw to Craig Counsell were also Golden Pitches, since every pitch could have won the World Series for either the Marlins (had Counsell hit a two-run double or three-run home run) or the Indians (had Counsell, for example, hit into a 6–4–3 double play). Counsell hit a sacrifice fly to Manny Ramirez in right field on a 1–1 pitch to tie the game 2–2. Mesa would go on to throw 21 more pitches before he was relieved by Charles Nagy with two outs in the tenth inning, but none of those 21 were Golden Pitches. Once the Marlins tied the game, the pitches thrown in the bottom of the ninth, tenth, and eleventh innings only had the ability to win the World Series for the Marlins. Because Baseball-Reference.com provides pitch counts for this World Series, we know that Mesa threw a total of seven Golden Pitches—four to Johnson and three to Counsell. The Yankees took a 2–1 lead into the bottom of the ninth inning and had Mariano Rivera on the mound. Mark Grace led off with a single, and Damian Miller reached on a fielder’s choice while attempting to bunt pinch runner David Dellucci over to second base. Dellucci reached second on an error, which put runners on first and second with nobody out. The two pitches Rivera threw to Miller were not Golden Pitches, since only the Diamondbacks could have won the World Series on those pitches (had Miller hit a two-run home run). The best Rivera could hope for in Miller’s at bat was a double play, which would have left the Yankees one out short of victory. However, once two runners reached base with nobody out, the conditions for a Golden Pitch were present, since the next batter (Jay Bell) could have either hit a two-run double or three-run home run (which would have won the World Series for the Diamondbacks), or at least theoretically, could have hit into a game-ending triple play (which would have won the World Series for the Yankees). Rivera threw one Golden Pitch to Bell, who bunted into a force out at third base, which put runners at first and second with one out. Tony Womack then faced five Golden Pitches from Rivera—each pitch could have produced a two-run double or three-run home run (which would have won the World Series for the Diamondbacks) or a double play (which would have won the World Series for the Yankees). On a 2–2 pitch, Womack lined an RBI double down the right field line, which scored pinch runner Midre Cummings (who had run for Miller) to tie the game 2–2. Rivera then hit Craig Counsell with a non-Golden pitch to load the bases before giving up the Series-winning RBI single to Luis Gonzalez. None of the pitches Rivera threw to Counsell or Gonzalez were Golden Pitches. Rivera, then, threw a total of six Golden Pitches: one to Bell and five to Womack. As was discussed briefly above, Bumgarner and the Giants took a 3–2 lead into the bottom of the ninth inning. Had he retired the side in order, Bumgarner would not have thrown any Golden Pitches, since no pitch would have had the ability to win the World Series for the Royals. But once Gordon singled and reached third base on the two-base error, every pitch Bumgarner threw to the next batter, Perez, had the ability to win the World Series for either team. On Bumgarner’s sixth and final Golden Pitch, Perez fouled out to third base to end the game and the Series. For all the talk following Game Seven of the 2014 World Series about whether Gordon should have tried to score, there does not seem to be much appreciation of how consequential it was to see Bumgarner throw six pitches to Perez, each with the awesome power of being able to deliver a World Series title to either team. Since we know there have been roughly 40 Golden Pitches thrown since 1903, I thought it might be illustrative to estimate how many pitches have been thrown in World Series history, playoff history, or even in baseball history. There have been 111 World Series played since the one in 1903 between the Pittsburgh Pirates and Boston Americans for a total of 643 games. Assuming 130 pitches per game per team, that means a total of roughly 260. That would yield 167,180 pitches. That means that only .02% of all pitches thrown in the World Series have been Golden Pitches. Beginning with the 1969 season, the playoffs were expanded to include two league championship series. Since then, 230 games have been played in the ALCS and 239 in the NLCS. In 1995, the playoffs were expanded to include two division series for each league. Including the strike-caused division series of 1981, there have been 179 ALDS games and 172 NLDS games. Finally, after another expansion of baseball’s playoff format, eight one-game wild card games have been played since 2012. Including the World Series starting in 1903, then 1,471 postseason games have been played. Again assuming roughly 260 pitches per game, that yields 382,460 postseason pitches. That means that only .01% of all pitches thrown in the postseason since 1903 have been Golden Pitches. Estimating the number of pitches thrown in regular-season games since 1903 would have been an extraordinarily difficult endeavor without the assistance of Baseball-Reference.com. Fortunately, that site has calculated that 186,579 regular season games have been played since 1903. Again assuming 260 pitches per game, I estimate that 48.5 million pitches have been thrown in the regular season since 1903. Adding the estimated 382,460 pitches that have been thrown in the playoffs and World Series, that brings the total number of pitches thrown since 1903 to roughly 48.9 million. That means that only .00008% of all pitches thrown since the beginning of the 1903 season (regular and postseason) have been Golden Pitches. Golden Pitches have only been thrown by seven pitchers, on seven different occasions, to 12 different batters, over the course of the 113 years since our current World Series format came into existence. 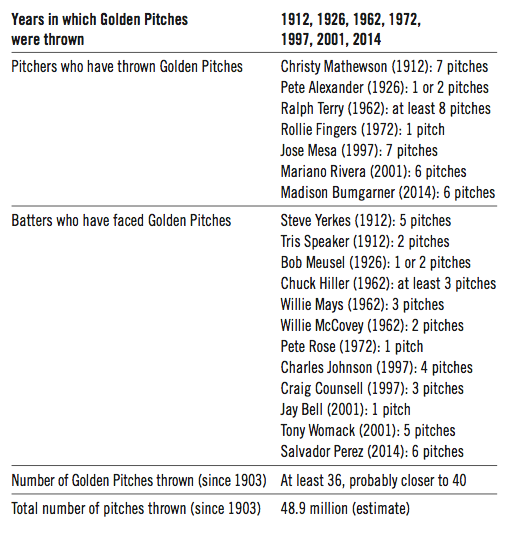 Roughly 40 Golden Pitches have been thrown out of the roughly 48.9 million total pitches thrown during that time. The throwing of a Golden Pitch is so incredibly rare, and so potentially consequential, that I found it worthy of note. Consider this final point. The 2015 postseason consisted of 36 games (two wild card games, 19 games in the ALDS and NLDS, 10 games in the ALCS and NLCS, and five games in the World Series). There were exactly 10,538 pitches thrown.6 None were Golden Pitches. Roughly 631,800 pitches were thrown during the 2015 regular season.7 This means that, excluding the 2015 exhibition season, roughly 642,000 pitches have been thrown in major league baseball games since Bumgarner ended the 2014 World Series by throwing six Golden Pitches to Perez. None have been Golden Pitches since. This is precisely the point of highlighting the existence of the Golden Pitch. How many pitches does a baseball fan see during one season, following the game on television or in person? Thousands? Tens of thousands? How many does he or she see over the course of five years? Hundreds of thousands? How many does he or she see over the course of a lifetime? Millions? The pitch is so elemental to the game of baseball, and it also enjoys a unique place in the fabric of our shared heritage. A parent plays catch with a child in the backyard. The President tosses out the so-called first “pitch” of the season. We’ve all participated in so many pitches in our lives—one way or another—but how may Golden Pitches have we seen? And when, we may wonder, will we ever see one again? Because fate frowned upon him, WADE KAPSZUKIEWICZ is a lifelong fan of the Cleveland Indians. While watching Jose Mesa blow the save in Game Seven of the 1997 World Series, he began thinking about Golden Pitches — and whether fans of any other teams had their hearts similarly broken by them. The author is deeply indebted to Clifford Blau for his work in getting this essay ready for publication. His knowledge of the game and attention to detail leave little doubt as to why he has been described as “the gold standard” for fact-checkers at the Baseball Research Journal. 1. The final game of the 1912 World Series was actually Game Eight, since Game Two ended in a 6–6 tie after 11 innings due to darkness. For purposes of this discussion, it shall hereafter be referred to as Game Seven, since it was the seventh and final game of that World Series in which a winner was declared. 2. This was the case for Game Seven of the World Series in 1909, 1934, 1945, 1956, 1967 and 1985. 3. This was the case for Game Seven of the World Series in 1925, 1931, 1940, 1946, 1947, 1964, 1973, 1982, 1986, 1987, 2002 and 2011. 4. This sequence was re-created from information contained at Baseball-Reference.com, which was also used for game data contained elsewhere in this discussion (unless otherwise noted). 5. Three of the seven pitchers to have thrown a Golden Pitch had their teams eventually lose the World Series—Christy Mathewson (1912), Jose Mesa (1997), and Mariano Rivera (2001)—almost certainly the only time Mesa’s name will ever be mentioned in the same breath as the two Hall of Famers. 7. 30 teams playing 162 games means a total of 2,430 games are played during the regular season. The total pitch count for the season assumes 260 pitches, on average, are thrown during a game.